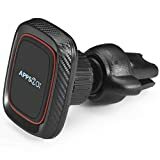 Best Magnetic Phone Car Mount - Don't Crack Your $250 Screen - Frugal Living, Coupons, and Free Stuff! The law in most states prevents the use of cellphones while driving. You shouldn’t be driving and using your cellphone. Though, we’ve all be guilty. I may not be texting while driving, but I need to see my phone for driving directions. There is almost no place I go without using the Waze app for directions. I also need to see who’s calling me, glance at a text message, and play a podcast. With all that said, it’s still very dangerous to drive and interact with your phone. 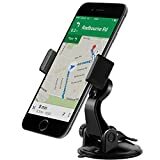 I am surprised how many Uber, Lyft, and Curb drivers don’t use dash phone mounts when using Waze, Apple Maps, or Google Maps. Rolling phone – my smartphone doesn’t tumble around the car when I make a turn. I would keep my phone in my cupholder or near my shifter. When I would make a right turn, it would tumble by my feet which is dangerous near the pedal. When I would make a left turn, it would tumble on the passenger floor and be nearly impossible to retrieve while driving or even parked. Eye-Level Viewing – if your smartphone is in your cupholder, in your lap, or on your passenger seat, your eyes are far from the road. Your eyes and head are so far from looking up that a car accident is inevitable. Charging cord cracking – If your phone is stationary and mounted, then your cord connector will flex less and the cord will last longer. There are complaints all over the internet of Apple cord connectors fraying. It’s a common frustration but can be prevented by bending the cord less. Some users are fans of the dash mount smartphone holders but I don’t like it because the suction cups are not as reliable. On extremely hot or cold days, the suction cups tend to give way. Also, the suction cups are more likely to weaken with heavier smartphones like the iPhone 8 Plus. I’m also not a fan of the car vent mount phone holder as they tend to fall off the vent blade. I always want me smartphone securely mounted as I don’t want my $1,000 phone falling and cracking a $250 screen. The best place to mount a phone in your car is in your CD slot. Nearly every car has a CD player that isn’t used nowadays. The in dash phone mount for your CD player locks itself within the wide and slim opening. You simply tighten a screw that tightens the mount firmly within your CD slot mount. The best magnetic phone car mount comes down to one factor. How strong is the magnet on the mount? Is the magnet strong enough? The strongest magnets can be used as a cd mount tablet holder. Let’s face it, the size of the new smartphones are blurring the lines between smartphone and tablet. There are many different magnetic cd mounts for your cell phone that claim they are the best. The in dash mounts tend to range from $10-$20 and all look about the same. Surprisingly, the best magnetic phone car mount in my CD slot is one of the cheapest. 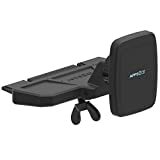 SECURE FIT - The CD Slot car phone mount silicon base is designed to fit securely into almost any vehicle's built-in CD player. Each magnetic holder is attached using a water soluble 3M sticker for a secure fit and easy removal. STRONGEST MAGNETS Using GripMax, our proprietary magnetic technology features magnets composed of Nd2Fe14B that are 44% bigger (12mm vs 10mm diameter), 33% thicker (4mm vs 3mm), and 91% stronger (3.5kg vs. 1.8kg) than anything else on the market, APPS2Car CD Slot Mount is able to attach your phone to your CD Player, and keep it there. 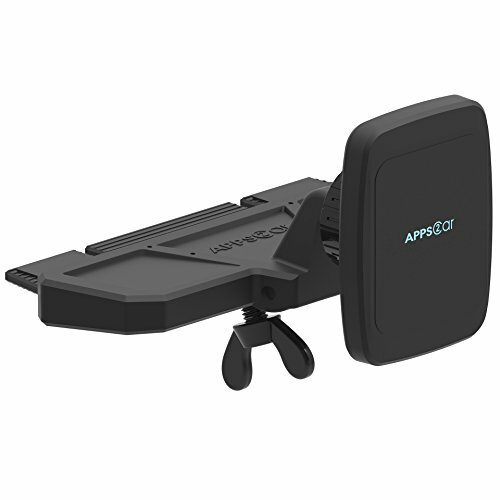 MAGNETIC PLATE WON'T AFFECT PERFORMANCE OR APPEARANCE OF YOUR DEVICE The magnet attached to your actual device is low profile and won't negatively impact its aesthetics, signal strength or battery. Strong Magnet: thicker and stronger than most of its competitors. It’s GripMax magnet technology supports up to 7.5 pounds of weight. The 4 magnets should be strong enough to hold technology like a smartphone, iPad, iPad mini, Android devices and tablets, and more. The adjustable 360 degree ball mount allows you to face your smartphone in your direction depending where your mount is in your vehicle. In my case, my mount is low, so I have my smartphone facing to the upper left. Securely Fits in CD Mount – the mount allows you to tighten it appropriately within your player. Tip: Do not overtighten the mount as you do not want to damage or crack the plastic on your in dash CD mount. Most of the people I know have a case on their phone for protection. The best way to use your new magnetic in dash mount is to simply put one of the supplied magnetic plates in your case. Once it’s within your case, it will immediately gravitate to the magnet and stick when nearby. It’s amazing how strong the magnet is and the phone never even thinks about falling off no matter how bumpy the road. If you don’t have a case on your phone, APPS2Car supplies 4 protective films that simply stick the metal plates to the back of your phone. APPS2Car was thoughtful when supplying the four mounts. The mounts come in gold, rose gold, black, and silver to match most smartphone colors. I actually bought a five pack of these mounts earlier in the year. My wife was confused why I purchased five magnet in dash mounts instead of just one additional for her car. I told her it seems like every time someone new gets in my car, they ask where I got it and send them the link. With no exaggeration, I sold all four within a week of driving some clients in my car. One of the guys had a car vent mount phone holder and hated it because it kept falling out and the magnet wasn’t strong enough. He purchased this in dash mount from me and hasn’t had a problem since. Please let me know if you like the APPS2Car mount or whether you like another mount instead.